If anyone has seen an episode of CSI, then players looking for an online slot that is representative of the show can finally rejoice thanks toNet Entertainment's Crime Scene. Crime Scene is a 5reel by 15pay-line game that does a very good job in creating an immersive experience that definitely leaves an impression on you, and rightfully so, there is a crime afoot and you are in charge of solving it. 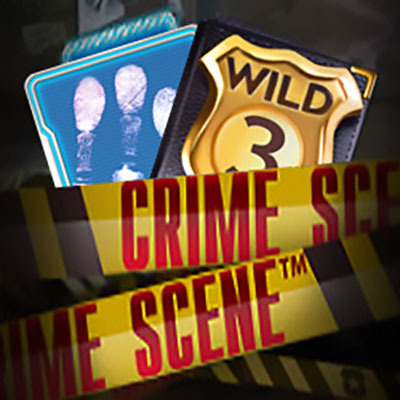 Players looking for those big scores should keep their eyes peeled for the sticky wild feature as well as the innovative Crime Scene bonus game, allowing players to earn cash through clicking on envelopes and folders in hopes of getting more insight into the case. Crime Scene can be played on various different devices including: Linux, Windows and Mac operating systems on laptops and computers, or on your mobile Android or iOS device. Plenty of opportunities to play and many ways to solve the case. NetEnt (short for Net Entertainment) are known not only for their highly anticipated online slots and games, but also for their pioneering attitude towards the industry itself. They lead by example with cutting edge titles such as Copy Cats and Hansel and Gretel. The CSI vibes are most definitely at play from the get-go here. The bodybag in the background is evident of this. Symbols in this slot also pull towards the investigative theme, all of which have different numerical based value depending on how many of these symbols are involved within the same pay-line. There also happens to be a variety of lower value symbols including your standard A, K, Q, J and 10 symbols, all of which are designed to look like chalk lines. The aforementioned investigative symbols take the shape of: guns, silver briefcases, pairs of sunglasses and a rather bloody shoe print. We mentioned Crime Scene's sticky wild feature above, and we did that on purpose. On-top of having a variety of other features, matching the police badge symbols will substitute for all symbols on the reels, except for the various bonus symbols across the board. The sticky aspect of this wild is that the symbol will remain in place for up to 5 spins, keeping your chances at using it within a winning pay-line always looming in the back of your head. Crime scenes are normally best to be avoided, in this case you are very much involved in the proceedings. Developers NetEnt have once again created an experience that takes you on a journey, and what we look for in our online slot experiences is simply that: memorable experiences. Everything from gameplay, to graphics, to theme, it’s all there and ready for players to absorb as they see fit. We would suggest players get a feel for this slot by playing a few games on a low bet to simply get a grasp of what to expect. Play Crime Scene now and solve the mystery of who won a lot of money.